I don't know of anyone that doesn't like a soft pretzel now and again. We all have smelled those delicious pretzels in the mall while walking by... just wishing, oh wishing, that they were vegan and made from whole grains. Okay, well, wake up! They aren't likely to have 100% whole wheat soft pretzels anywhere you go but hey you can make them at home - EASILY! This is by far the easiest soft pretzel recipe I have tried so far. Some require several long rises and boiling the pretzels. Those are delicious, trust me, but more work. This one just requires a short rising time and a quick dunk in baking soda water for that authentic pretzel flavor. It's based off a King Arthur Flour recipe (here) but of course tweaked to make it whole grain and vegan. Yes, they require yeast but do not be afraid of the yeast. Buy some fresh stuff, have confidence and follow the directions. You will have some yummy soft pretzels soon enough! Now of course these are much heartier than any soft pretzel made with bleached refined white flour. That's not a bad thing though!! They are far more filling, have a delicious bite and really stand up to thick dips (also, they are McDougall friendly and Plant Strong!) I recommend using a White Whole Wheat Flour instead of regular whole wheat flour because it is a lot softer in texture. It just works so well in so many recipes that it's my go to whole wheat flour. And what's a pretzel without some fun dips to go along with it? I made a Creamy "Honey" Mustard Dip (This one I've got more plans for! ), a Beer Mustard Sauce and a Beer Cheese Dip. Of course beer because beer and pretzels are best friends. I think it would also be good with the Vegan American Cheese and Ro*tel Dip so you've got all sorts of options! Place the first give ingredients into a bowl and stir until well combined (you can also do this with your stand mixer.) Start with the lower amount of water and add a bit more water as necessary to get a nice soft dough. Knead the dough by hand or in your mixer for about 5 minutes, until it's soft and smooth. Sprinkle the dough with flour and place it in a plastic bag. Let it rest for 30 minutes. While the dough is resting prepare the baking soda bath. Combine the boiling water and baking soda in a heat proof dish (I used a small 9x9 dish.) Make sure to stir until the baking soda is totally disolved. Set it aside and let it cool. Once the dough has rest for 30 minutes take it out of the bag and place it on your working area. Cut the dough into 8 pieces and then let the pieces rest again for another 5 minutes. Preheat your oven to 425 degrees. Line a large baking sheet with parchment paper or a silpat baking mat. 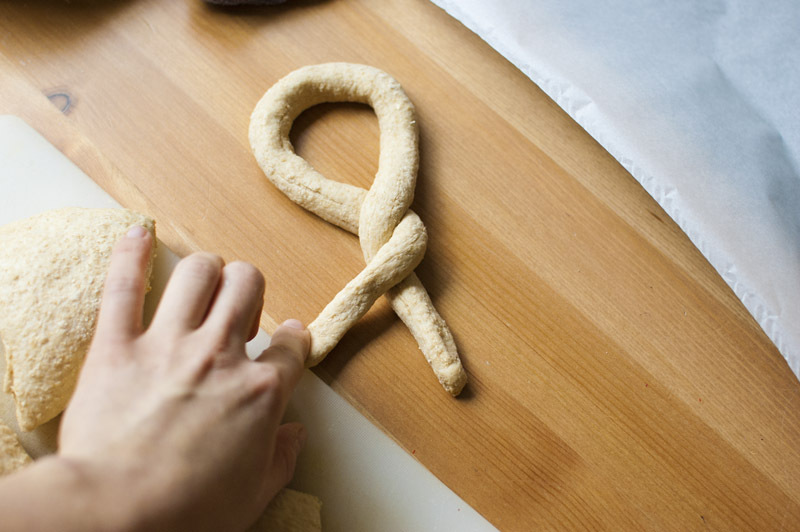 Roll each piece of dough into a long rope (my daughter said it was a snake!) and twist each rope into a pretzel like in the images below. then they get to bathe in baking soda water! Once they are formed into the classic pretzel shape dunk them into the baking soda water. Let them soak for about a minute, flip them over and then let them soak for another minute. After they've soaked place them on your baking sheet and sprinkle with some coarse, kosher or pretzel salt (optional but delicious!) Let them rest again for 10 minutes. Place them into the oven and let them bake for 10-12 minutes or until lightly browned. Bring the beer to a simmer over medium high heat in a really small sauce pan (as small as you've got!) Cook until the beer has been reduced down to about 1/4 cup. It should be thick and syrupy. Mix in the mustard and maple syrup. Blend everything together until it's very smooth. Heat it up until its warm. (Again, I used my immersion blender for this!) Leftover should be kept well covered in the refrigerator for 5-7 days max.